Every week I try and create a healthy, hearty pot of vegetable soup or chili that I can have on hand for lunches or quick dinners when time is limited. This week, I bought a couple of bags of dried black beans which are really inexpensive and simmered the beans with onion, garlic, and seasonings until they were tender. 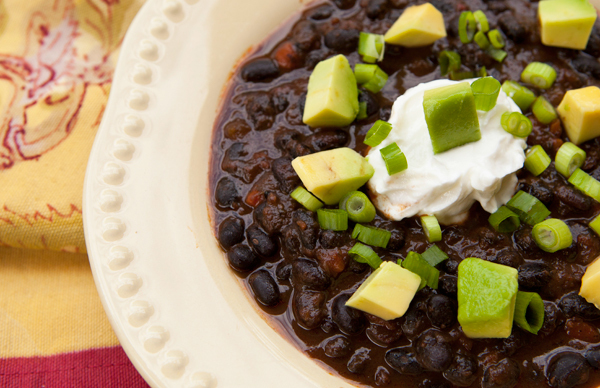 I then divided my beans into containers, and froze some to be used later, and created a big pot of this black bean chili with the rest. This is a vegetarian chili, but the slow simmer and flavorings create a texture and flavor that is truly delicious, and you will ever miss the addition of meat. When I make soups, stews or chilies such as this one, I portion the soup into freezer containers to serve two, and freeze most for future meals. I usually have two or three different soup varieties in my freezer at any period, and I simply take out a container from the freezer in the morning, and by lunch it is ready to be reheated for a hearty lunch. 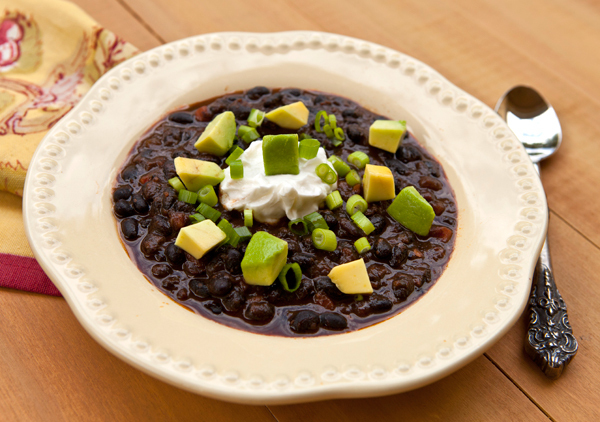 The high quantity of both protein and fiber in black beans help to move food through the stomach to the large intestine at a healthier pace supporting a healthy digestive system. The high fiber content also helps to curb hunger cravings. Black beans have the highest levels of antioxidants of all of the common beans tested, as much as the antioxidant-rich cranberry. Black beans are one of the best sources around for the trace mineral molybdenum which serves the useful purpose of breaking down the sulfites found in foods which some people are sensitive to. Black beans are also a good source of the minerals magnesium which helps to maintain a healthy blood pressure, iron to help maintain healthy red blood cells, and Folate, or vitamin B6, which is very important to pregnant women in particular. Heat the oil in a heavy stockpot, and cook the onions, celery, and carrots over medium heat, until the onions are translucent, about 5 to 6 minutes. Add the garlic and cook just until fragrant, another minute or two. Bring to a boil, then reduce the heat to a simmer, and cook for 45 minutes until the mixture is thick. Taste, and adjust seasonings, and serve with your garnish of choice. Note- If you prefer a thicker texture of your chili, you can remove a cup or so and puree it in a blender or food processor then return it to the pot and stir.